Remember when you called the shots on what devices your colleagues were allowed to use? Remember when it was you who determined what they could and couldn’t connect to the network? Remember when BYOD meant nothing—except that maybe there was a typo on that invitation to the neighborhood barbecue? Feeling nostalgic? Well, we haven’t found anyone who will declare that bringing one’s own device to work or school is merely a passing phase. Nor is anyone arguing too loudly that video communications are going out like the typewriter. 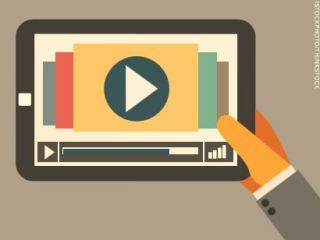 Put the two together, and not only are you dealing with managing enterprise video, but now you have to consider what needs to be done to make it mobile. And, if we’re to believe Cisco, this issue will become an increasingly important one in the next few years: the company predicts that as of 2018, video will account for over two thirds of the world’s mobile data traffic. “This is creating some challenges for people who have been using traditional, proprietary streaming solutions for many years,” said Chris Knowlton, vice president of product management at Wowza Media Systems LLC, a video management software developer based in Evergreen, CO. Especially since different devices require different protocols. But what do you do with your existing video library that contains clips the organization still wants to leverage? “There’s often an additional step that’s needed to import all those existing videos into a video management system that will convert them so that they can play back on any device,” Bixhorn explained. He cited an example, whereby a client had been storing video content in SharePoint; the content was formatted as flash video, which isn’t supported on iOS devices. “We talked with them about a solution that would let them import those flash videos into Panopto’s video management system and then automatically convert them to formats that would work not only with iOS devices, but that also play back on desktops, Android devices, Windows phones—whatever device they may be using.” He adds that these are typically the types of compatibility issues that tech managers face. While sites like YouTube, Vimeo, and Dailymotion are specifically designed for discovery––if you want to go viral, that’s where you post—the bulk of enterprise video is intended for controlled distribution: certain people must watch it, and others won’t be allowed to. Which begs another question: What about security? “When you bring [video] to work, when you bring it to healthcare, when you bring it to higher education, and, for goodness sakes, when you bring it to K12 education, it’s like they say in sports: Security isn’t everything; it’s the only thing,” said Sean Brown, senior vice president at Sonic Foundry Inc., the developer of the Mediasite video management platform. The good news, Brown believes, is that video can be secured like any other data form through enterprise management tools like the one his company offers. “Access to video is mediated by database security and Web security, active directory, federated security—all the same things that secure email and Web sites and everything else. It is no harder to secure than all other data types.” And, if the public or outside parties don’t have access to your private enterprise data in the first place, your risk exposure decreases. One of the challenges with video is metadata, which is often treated as an afterthought—requiring someone to create tags manually after content has been uploaded into a library. Ari Bixhorn, vice president of marketing at Panopto, encourages organizations to capture metadata from the outset, while the video is being recorded.